John E. Kennedy - Reason Why Advertising: The Kennedy Master Secrets are now in a new ebook for you. The Kennedy Master Secrets are now in a new ebook for you. Well, we are about half-way through getting it to all the distributors. Thought you'd like a peak at the cover and what to expect. Yes, that's a new title - something a bit more dramatic. It's fascinating to me that some marketers still don't use the industry standards laid out over a hundred years ago. If they ever did take Kennedy's definition of advertising as "Salesmanship In Print," they'd change a lot of the trite and overused junk they pass off as the "latest" in gimmicks from self-styled "guru's." I can't stop here and give you a full review at this point. As I said, I'm only half done with the 9 books (plus a couple more) that still need to go out to the top distributors. It's also coming out as a paperback, so you're double-blessed. 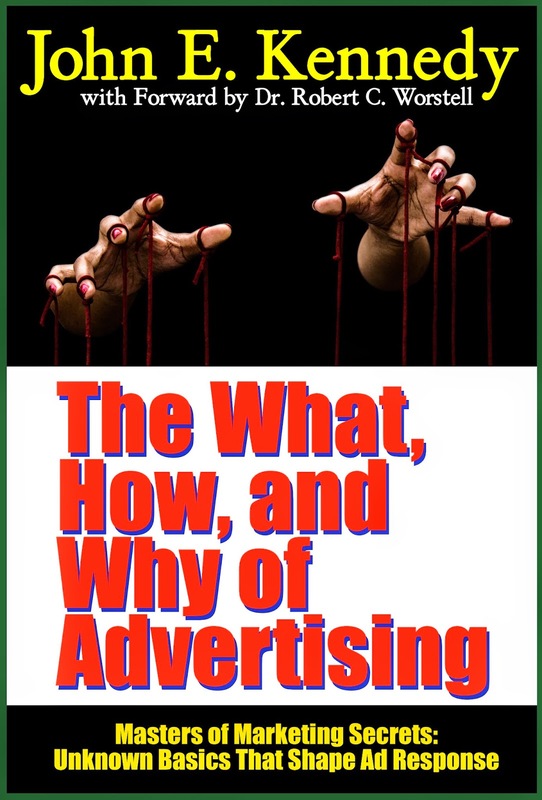 "Reason-Why Advertisting" and "Intensive Advertising" Now Available in all Fine Bookstores!